Music Row Tech: UPDATED: Siri Come Save Me From My Acura! UPDATED: Siri Come Save Me From My Acura! It appears Apple has struck agreements with a number of car manufacturers to integrate Siri into their upcoming we models.TechCrunch reports today that Audi, BMW, Toyota, Honda and others will provide a Bluetooth enabled direct link to Siri in future designs. Couple this with Apple's announcement of integrated, voice, turn by turn directions, and my "fights" with my Accura may soon be at an end! My 2009 Acura TSX is a great car. 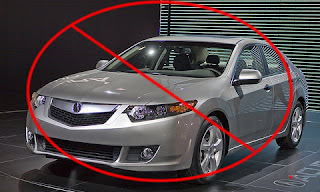 I am an Acura fan and other than an Infiniti G35X which I happily drove for about six years before handing the keys over to my daughter (which is another story entirely), I have to say my TSX is the best combination of reliability, practicality, and driving experience, I have had over the past twenty or so years or car ownership. Notice I didn't say this vehicle was the most "fun," or "best driving," car, but this car embodies value which is a defining term for what I look for in all purchases. In particular, the car's voice recognition system makes Siri look like a Rhodes Scholar and Nobel Laureate even though Apple still labels this program as a beta! The simple act of getting the car to dial a 'phone number is ludicrously difficult. "Call, Rachel" I command. "Fan off" the car politely responds. Undeterred, "Dial Rachel" I request and the car spits back, "XM Radio off." OK..... Let's try another tack, list Phone Book... The car spits out the THREE numbers I have MANUALLY entered because the car cannot successfully IMPORT my iPhone's Contact List! "Yes!" I cry, the second number is my daughter's mobile! "Call Rachel," I beg! The saccharine voice comes back, "Your options are, list, dial, next, last, store, previous." I am now halfway home and wondering what the point of my calling is. The dog is looking at me. Chab licks my face sensing some inner frustration, unsure what is going to happen next. I click the "talk button" on the steering column again and say, "Dial 999-555-2525." The car regurgitates, "Dial, 999-555-2525, please say store, dial, continue adding numbers, or stop." "Stop, please stop, I mumble...." The car says, "Dialing stopped." "No!" I scream into the microphone in the ceiling (but the dog takes it as a personal insult and curls up in the backseat no longer having any interest in the outcome of this fight). I take a final shot, repeating the phone number, saying "Dial" (twice) and am greeted with the sound of the phone ringing and my daughter actually answering (two miracles in thirty short seconds!). Chab hears my daughter's voice and seems to find renewed interest in the goings on. After a two minute phone call, I hang up and drive the final mile to the house. Elapsed time, twenty minutes-- time "talking" to the car-- ten minutes; "talking to daughter," three minutes-- cursing at the process and driving, seven minutes! Really!!!? POI and mapping-- My Google Maps stay up to date (free of charge, thanks Google), but the car's built in maps were dated the day I bought the vehicle. Cost of updating $180 (for a single year) and some hassle. Turn-by-Turn Navigation- My five plus year old Garmin GPS could give navigation instructions using actual street names.... Turn right on 16th Avenue South.... in a quarter mile turn left on Edgehill Avenue.... My iPhone App-- Motion X GPS Drive (but there are many others to choose from)-- provides the same "human friendly" interface. My car, "Take the 2nd left," "Take The Next Right turn." "Oops you missed it!" (I wish it was that expressive!) My point, this car technology hasn't even kept up with year's old portable GPS alternatives. I know Apple will eventually gut the Google Maps cord and offer a turn-by-turn map experience, but for now, you need an Android device or a paid third party app to get really decent, verbal, instructions. You would think this is one area the car companies would get right, and they don't. Asking the car to go to anywhere other than home (once you wade through the manual, and it does take some study! to program the car as to where "home is" the "Go Home" command seems to be the one voice entry which Wynona gets right on the first pass) is also comically frustrating. Without exaggeration, it can take twenty exchanges or more to get a new destination verbally entered and confirmed into the system's onboard navigation. How is this helping to improve driver concentration or blood pressure!? Radio! Try using the voice commands to find an XM Radio Channel, much less a category such as "News" or "Country" and have it scan the available listings! Here's a hint, you can't (and if you can, it will require the patience of Job and a careful reading of the manual dedicated to this system which is intended to keep you from getting distracted while driving!)! Pull over and start tapping, that's the only safe way to change channels. Having a conversation with Siri can also be amusing. At times, people go out of their way to have funny conversations with "her." Just Google "siri funny conversation," or do the same on You Tube and there are countless examples. However, Siri gets it! Which is to say, Siri understands more often than not and contextually is much better than any other voice activated system. I think asking my car to "Call my daughter" is more likely to get the windshield wipers to turn on and the fog lights to turn off than to initiate an actual 'phone call To Rachel. Siri takes this same request and politely tells me she is, "Calling Rachel." And as for transcribing text, Apple's servers are getting more and more of this right with each passing week. My car doesn't understand, "Call," or "Go To," much less complete sentences, paragraphs, and punctuation! Some automotive companies are working to directly integrate smartphone technology with their onboard systems. This is a paradigm of intelligent design; smartphone operating systems iterate several times faster than car systems (for legal, design, and other reasons). Why not let your iPhone just bond with the bigger, iPad like, screen in the car and use the best of both worlds? My current dream car is the Tesla Model S and not because I am a particularly "green" individual or because I stay up at night worrying about global warming (quite the opposite). The great interior and touch screen of the Model S which enable tablet and smartphone interaction are as enticing to me as the 435 horsepower, 0 to 60 in 4.4 seconds specs and 300 mile range with optional battery. Voice enabled systems are rapidly improving. We need companies to quit making closed systems and begin utilizing the best of consumer devices in smarter ways. I think Tesla and Ford are on the right road, here's hoping others will follow. I enjoyed a lot reading your post, I love my Acura but I'm also dying for a Tesla.